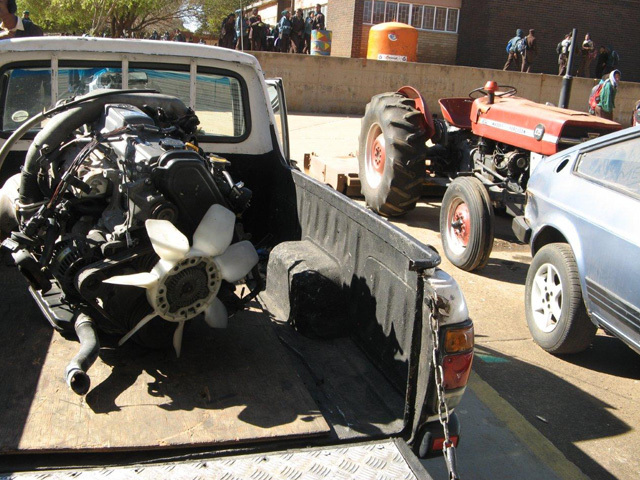 The engine that the school has bought with a portion of the money sponsored. Hats off to the passenger & commercial vehicles division of Eqstra Holdings for supporting two schools in Gauteng to address South Africa’s technical skills shortage. Eqstra Flexi Fleet, the commercial vehicle leasing and rental business unit, has adopted Pretoria Technical School while Eqstra Fleet Management, the passenger and light commercial leasing business unit, has adopted Rhodesfield Technical School in Kempton Park. Both these institutions are training learners to become productive future members of South Africa’s work force. The sponsorship of Rhodesfield Technical High School amounts to R478 000 and the investment made in Pretoria Technical School amounts to R344 000, which will be used to improve learner education and the purchase of equipment, as well as offering scholarships for disadvantaged students, “We want young people to become aware of the possibilities and be more enthusiastic about the available opportunities to become technically skilled and employable in our industries,’ says Carr. Tools to learn , Rhodesfield students standing by the engine. These sponsorships form part of “Eqstralution’, a serious commitment by Eqstra Holdings to create and support skilled, qualified and productive individuals from a pre- school to tertiary education level. This ensures that a difference is made, not just to the learners’ lives but also to their families and the communities in which they live. The Eqstralution approach is to focus on educational institutions where the majority of learners come from disadvantaged backgrounds, while not losing sight of the need to ensure the development of femalesand learners with disabilities. “By touching the lives of learners in the areas we operate in, we can make a long-term and positive impact on communities forever,’ explains Walter Hill, CEO of Eqstra Holdings. “Our socio economic development program focuses on the process of up- skilling young learners to ensure that critical knowledge and business skills are embedded from an early age.’ With the support of all the divisions of Eqstra, the total investment in this initiative currently stands at R2.5-million to support sustainable investment in education in South Africa. We also lift our hats high to Mercedes-Benz South Africa (MBSA) for hosting some 100 Grade 10, 11 and 12 students with Mathematics and Science as subjects at the recent Johannesburg Motor Show. On the first day, students from the Bokgoni Technical School in Atteridgeville had the opportunity to experience first hand the most modern and coolest vehicles available on the roads today, while the next day it was the turn of students from Bothlabelo High School at Oukasie, Brits. They were bussed to the show by Mercedes-Benz under the banner of “See what learning Mathematics and Science can do for you’ and as part of the Mercedes-Benz Maths, Science and Technology (MST) project which has been supported by MBSA with R4.5-million between 2008 and 2010. The objective of this particular education-focused project is to develop skills of both educators and learners at 10 schools in the Bojanala region of the North West Province, as well as in Atteridgeville, which is located west of Pretoria. The long-term objective of this project is to secure an increase in the number of qualified personnel, much needed in the automotive industry, and which supports MBSA’s strategic approach towards developing communities in order to gain better access to the economy. At the show, Nobuzwe Mangcu, MBSA executive director and divisional manager: group corporate affairs, made use of MBSA’s expansive exhibitions and exciting product showcase to stimulate the youngsters’ interest in the automotive industry as a possible career stream. “Studying Maths and Science provides the base for further technical studies. These are scarce skills in South Africa and we want to encourage more young people to pursue technical fields of study, thereby creating a bigger pool of these much-needed skills,’ says Ms Mangcu. Ah, isn’t it wonderful hearing a young person saying he wants to be a “successful professional’ so that he can drive such a car. Will all current tenderpreneurs please take note! Well done to Eqstra and MBSA. It’s actions such as these rather than marches through the streets that will ensure a bright future for the youth of South Africa.